We provide a variety of campaign packages and add-ons to ensure your campaign website meets all your expectations. Purchase a Campaign Website Package from the List Below along with any Additional Services. After your Purchase, you will be Directed to a Web Page to Upload your Content. The Professionals at Poli-Site Develop your Campaign Website and then give you Back End Access to Make Changes. With the advanced website package we will not only create a custom website for you with your campaign colors and imagery and also create the initial content needed to launch your website. After purchasing this package we will send you a short survey to assist us in creating the content and then we will curate personalized content to launch your website. 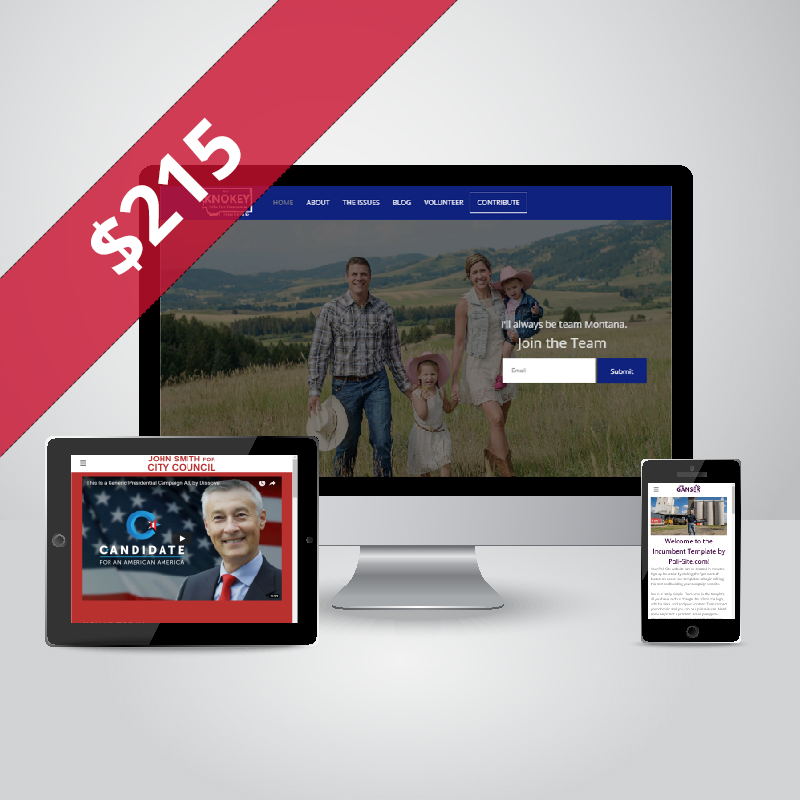 Once the campaign website is launched, we will grant you and any campaign staff access to our the website's back-end to make changes in the future, add content, and view website analytics. We will continue to offer support as necessary. This package is for 12 months from when the website goes live and can be extended through repurchase after the year is over. We also include a free domain with this package. With the complete website package, we will build a custom website with your custom colors, logo, pictures, and video content. Upon purchasing this package, we will send you a survey outlining the standard pages within a website with the ability to add more as you go. After the campaign website is launched, we will grant access to the back-end of your website where you can customize it further, add/change content, and view your website analytics. We will continue to provide support as needed. A lite website package is best for those that only need a short-term campaign website solution. With this package, you get all the features of a complete website package for a six month period. With this package you can add on "custom content" from our add-on page that will instruct us to curate personalized content for your website to prepare if for launch. Once live, we provide you with the tools necessary to edit your website while continuing to provide full support. This website package only lasts for six months but can be extended upon request. We also include a free domain with this package. Get a professionally designed campaign website launched in no time. Our software integrates seamlessly with PayPal. Use PayPal or link your website to your own custom fundraising platform. Integrate all of your social media accounts by either linking to them or embedding their feeds on your website. Search engines play an important role in creating awareness. Our websites are developed to get your website ranking on search engines. Recruit volunteers to assist you in your campaign. Want to provide a space for visitors to request a yard sign? No problem! Add a blog, countdown timer to election day, and customizable forums.